This post is a collection of thoughts about Dogme ELT (and the need for a balanced approach) from around the blog-o-sphere, beginning with a little of my own commentary, of course. A balanced approach to language teaching is like a complete protein. When I took Nutrition 101 during my undergrad years, we learned about proteins. There are four different kinds of vegetable protein sources, but they are “missing” something. For example, proteins from the “bean” group are missing something that is found in the proteins from the “corn” group, and proteins from the “rice” group are missing something from the “nuts” group. 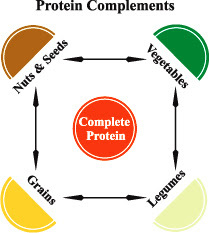 You need to get proteins from multiple different vegetable sources in order to be sure that you have a complete protein. Teaching approaches are like vegetable proteins – they need to be supplemented with other approaches. Dogme ELT offers an incomplete protein...and that's not a bad thing--you can still use it to make a complete "teaching" protein in a balanced approach. Here are some quotations that support the need for a balanced approach to language teaching. Rebekah, it is a very interesting blog post regarding 'balance' in the classroom. My IATEFL talk in Glasgow in three weeks will look at the aspect of balancing between eclectic forms of teaching (Dogme ELT) and more traditional stuctured forms of teaching. It is a wonderful blog post and it would be wonderful to see how your ideas on teaching develop and whether you decide to do an action research on 'balance' in the classroom. I wish I could hear the talk! Will you be posting a summary or a recording? The more I read about it, the more I think that a balance approach seems so...obvious. And Action Research...an interesting suggestion. I think I will look into developing a project now. Thanks for the comment! Rebekah, I shall be posting up a video of my talk on my website and will make all my materials, handouts and presentation slides available on my website as well. Looking forward to further information about your project. Should you need any help, please do not hesitate to ask. Great! Can't wait to see/hear/read it! Interesting discussion... I just discovered right now (following your blog) that there is such a term as Dogme ELT... even though I've been using this technique for years (at least according to the basic premise outlined in the Wikipedia article of the same name). I've had the latitude and experience that's given me the best of both worlds: I've taught from textbooks for years... and now I teach using my own material (I think you may be familiar with my site). I believe that when using any textbook, the teacher should be adept at manipulating, adapting and supplementing the material at hand. I've seen great results... so it very much depends on the teacher. On the other hand, the material that I develop every week for my private English classes, as far as I can see, follows the Dogme ELT approach. I use my own material (which would be considered advanced) for all of my students that have at least a pre-intermediate level of English. For basic and beginner students I use structured textbooks... they need this... I take out the most important parts and then expand on them an any way possible. I use textbooks for beginners just for the systematic approach... and then from pre-intermediate I like to use what I call "simultaneous learning", where any student can learn anything within the context of conversation from that point on: vocabulary, phrases, grammar, pronunciation etc. I would put it like this: Dogme ELT would be like filling in the pieces of a jigsaw puzzle until you see the image starting to take shape. Within the context of everyday conversation, of course, the most important features will emerge first... As far as using textbooks go... I would liken the textbooks to the border of the puzzle... I think most people construct the border before working on the inside of the puzzle... it just makes sense. Then, from there, bit by bit, you can focus on anything that catches your attention (still working logically though)... working a little bit here... a little bit there. I believe that "advanced" grammar can be tackled by a pre-intermediate learner at any point. The teacher has to get a feel. If he can't manage, then he can move on the something else within the framework/ topic until somewhere down the line in the near future. The main difference is that the Dogme ELT approach requires consistency... it requires that the student put in sufficient time to slowly but surely fill in all the pieces of the mammoth puzzle. Which is better... having random pieces missing in a puzzle (Dogme ELT approach), or having rows 15-40 (textbook approach) completely missing. In fact, I think the random approach will give you a better overview. Once you start putting things into practice it stops being theory and it all makes sense. You'll never know until you test something out. What I can tell you without a doubt is that my methodology has worked with students that have stuck with me long term. I teach 8-10 hours of classes a day from home... been doing that for years. I see the results... but then again, you may have to ask my students about their experience with conventional courses as opposed to the approach I use. The proof is in the pudding. Hi Frank, thanks for the comment! It seems like a lot of good teachers who find out about Dogme say the same thing - I've been doing this for years! In that way, it really is just a part of good teaching. I really like the ideas that the approach presents, as well: student centered learning, flexibility, etc. -- these are all things that should always be important, no matter where or what you are teaching. I'm not a fan of text books either, so naturally, the materials-light aspect is appealing. My concern with Dogme is mainly that, in order to bring students to an advanced level of speaking, you do need some challenging structures that they can really get by without (i.e., "had been going" when "used to go" will normally cover about the same meaning -- not a perfect example). I don't know if you can systematically cover advanced structures without some sort of outline/guide/order. Will emergent language techniques eventually hit everything and randomly fill in the puzzle, like you suggested, or will you always have a few pieces missing? I agree with you whole-heartedly Rebekah. There may be some pieces missing that don't present themselves naturally in conversation. With some of my students, I divide our class into a grammar component (using a bare-bones grammar book) and then have our "conversation class" after that with the material I have, always looking for an opportunity to incorporate what we just learned. In that case, I like to split it 20/80. I usually focus only on Idiomatic Expressions and Phrasal Verbs (using the same material in my conversation classes)... and I had found a comic strip with the phrase "Used to be"... I thought to myself, "I can use this to illustrate the difference between 'be used to' VS 'used to'". 'Be used to' appeared, at first glance, to be a phrasal verb... and then I almost scrapped it because I soon realized that it was actually an adjective"... so I thought I'd give it a shot and create a basic "grammar" lesson explaining the difference between the two. My students absolutely loved it (not that I would ignore grammar in class... on the contrary) because here they got to focus on using both structures for an extended period of time in our conversation class. As a result, I am planning on creating grammar lessons, using as a springboard something that I come across in a comic strip... and of course, turn it into a conversation class with a number of examples. The examples are created to stimulate conversation. So, finally, after a number of years, I have found a way to cover even the advanced structures (all the perfect and conditional tenses etc.) within the methodology that I employ, so that we don't overlook anything significant. It all depends on the material that is used as "support material" for a conversation class. I wanted to add that the Dogme ELT approach can definitelty be used within the framework of a textbook if the teacher knows how to manipulate the material for conversation purposes. In fact, many good teachers already do this... it's taking the conventional and reshaping it to suit the situation. Not every teahcher can do this. You have to give of yourself. Also, I believe that every English class should and must be made into a conversation class, indpendent of whether you are using a textbook or not... independent of the students' levels... and independent of the size of the group. I do it all the time. Conversation is not reserved for advanced students. Students should be speaking from the get go.